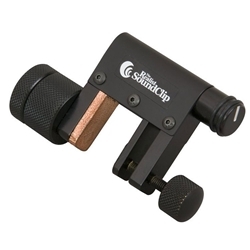 The Realist SoundClip clamps easily onto the bridge of any string bass or cello, without marking or damaging. Clamping allows it to be added or removed at any time without hassle. Great for travelling bassists and cellists, or for those who want a pickup only when they're using an amp. The SoundClip sports features that are not found on any other pickup. The on-board volume knob gives the player full control to adjust output on the spot. The innovative variable weight system helps to contour tone, and it's fully adaptable to all playing situations.